Two older men approach outside the Five Star Diner late Friday afternoon and one says in an unmistakable thick Old Union City accent, "Didn't I see you at an earlier Hugin event in town?" The man immediately dives into his immense distaste for Senator Bob Menendez without missing a beat upon hearing no. He speaks through a smile as if he's recounting the details of becoming a father for the first time. A car comes cruising down a busy 32nd Street and the driver yells out the window with a greeting in Spanish. A full-throated response rings back before the man returns to our conversation and says, "That's (name redacted), a Union City commissioner and (they) support Bob Hugin but can't say it publicly. The threat is dialed into Mendendez matter-of-factly. This is, after all, the Hudco boss' turf and home base. 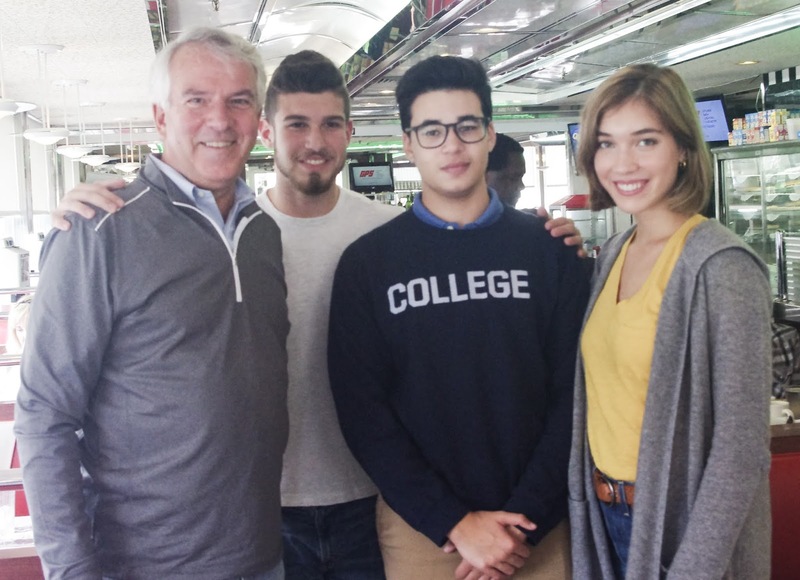 Inside the diner, a staffer makes introductions to New Jersey's main challenger for the US Senate seat, Bob Hugin; who currently finds himself declared via Stockton University's recent statewide poll in a dead heat with incumbent Bob Menendez. For a man who's invested millions personally and committed to taking on NJ's senior senator and county boss in his own backyard, he appears remarkably relaxed. It's the latest pitstop of three-hundred campaign stops. Unlike the affectations of Menendez's verbalizations, Hugin looks and sounds like an everyman who can be found across New Jersey. The down to earth pedigree hides the substance underlying an initial greeting. A graduate of Princeton where he attended on a full scholarship with an MBA out of the University of Virginia, the Union City native then served as an active duty Marine infantry platoon commander and battalion staff officer for the 3rd Battalion 9th Marines from 1976 to 1983. Later, he served as a reserve officer to 1990. Both sons followed their father's footsteps with service in the Marine Corp.
From the outset, the former executive of pharma firm Celgene is personable but clearly devoid of a politician's airs. The relaxed demeanor conveys the language common to senior executives who intuitively know how to connect with people at all levels. He offers a couple of questions about life in Hoboken before casually adding with no small amount of pride those in Union City he remains friends with to this day. This is a man comfortable in his own skin and feeling more than a bit at home. Candidate Hugin then shifts his attention to other diners who enjoy a few minutes before taking photos with him. The gathering has the appearance of a late afternoon calm in the quiet time between lunch and dinner. What issue, if any, is common across the state? There is Hugin succinctly says, "affordability is the number one issue." The lack of affordability in the Garden State he says" is tearing families apart." He continues addressing three related areas. The first he says is safe communities and opposition to sanctuary cities with the second the importance of education for their children. The third issue he adds focuses on jobs and restoring economic confidence allowing for economic mobility to find another keeping families together. The executive focus becomes evident when Hugin lays out short, mid and long-term objectives and hits the integrity button hard combined with leadership while doing so. "What can I do as a leader to influence action and results? Long term, we're going to lead with integrity, honor and values so people have pride again (in NJ)." He clearly doesn't shy away from a challenge flatly admitting, "It's going to take time to turn it around." How to move from senior executive and tackle the job in the Senate known as one of the world's most deliberative bodies? "We have been so unfairly treated in Washington as a state... Bottom line is I'm optimistic there's so much low-hanging fruit where New Jersey has gotten a raw deal. We're going to work on all objectives." Then in the next breath, Hugin looks ahead seeing himself elected. "When I win in November, I'm going to call on Governor Murphy who I don't agree with on a lot of his policies for higher taxes and more spending and say, let's identify two or three things this next Congress and work on these things together. We're going to fight for New Jersey. There's a lot to be done." He mentions the Gateway Tunnel saying it should have been completed 25 years ago noting infrastructure is a "good economic investment" and with a better public-private partnership NJ can obtain faster results at a lower cost. On the healthcare front, Hugin has much to say after spending almost two decades in the pharma business leading the helm in a company turnaround and development of cancer drugs where he became quite wealthy in the process. He references a healthcare roundtable only days earlier. There, he advocated for coverage on pre-existing conditions and patients setting guidelines on end-of-life care, where costs skyrocket and burden the health care system most. He wants to see better solutions integrated using technology but as a Republican, he adds partisanship in this political climate needs to be sublimated in working toward that objective. Bob Menendez is trying to hit back on those drug costs under Hugin's stewardship but hasn't connected with a knockout blow. Political observers expect he'll ratchet it up and as Election Day approaches highlight financial support Hugin gave in 2016 to President Trump. It may be the incumbent's last chance in the hopes to be gifted with six more years as NJ's senior US senator. Hugin, on the other hand, is building on his effective campaign efforts to get out the message defining who he is and the professional solution-based perspective he offers. As a result, the NJ Senate race may come down to who defines him most to voters before they go to the polls in November. The camera overheats shutting off the recording and ending the impromptu interview; a perfect metaphor for the dead heat election race New Jersey finds itself for its US Senate seat. The Hudson Mile Square View website was born in 2009 after former Hoboken mayor and convicted felon Peter Cammarano's corruption came to light and the public learned he took $25,000 in bribes from an FBI informant. No regular reader will be surprised to see Bob Menendez easily makes the corruption grade here and should be replaced. Send in a Marine.